Julie Isphording, a member of the first women's marathon team in the 1984 Olympics. Dear Family and Friend Donors, I have good news to report -- the marathon is behind us!! This past Sunday in Washington, DC, at 8 a.m., in front of Arlington National Cemetery, I joined close to 30,000 runners as we raced the 34th Marine Corps Marathon. The race-day conditions could not have been better: a cold front moved in earlier that morning and with it came crystal blue skies, a light breeze, and low 50's -- the **perfect** combo for running 26.2 miles . . .
For starters, the Marines heralded in the marathon with a pre-race prayer, and as our national anthem was sung by the cast of Jersey Boys, two fighter planes dipped their wings in recognition of those who had served our country so valiantly, the headstones of whom were just behind us, awash in the morning light as the sun rose across the Potomac River. Then there were three gunshots -- first, for the wheelchair competitors; second, for the elites; and third, for the rest of us. For me personally it was exciting because this course would be different and more challenging from that which I ran in 1996. This time, for the first 8 miles, we were greeted with two large ascents -- the first up Lee Highway in Arlington, VA, and the other up Reservoir Road near Georgetown University in NW Washington. The combination of those two climbs got the engines going. As we passed the Key Bridge, I saw the faces of my family for the first time -- Peter with Elsie on his shoulders, and Lila and Dylan joined by their grandparents Whitman and Robinson. From that point we ran down M Street in Georgetown (which was packed and lively), took a sharp right onto Wisconsin Avenue near the old Bayou (for those of you who saw Dave Matthews Band in their early years, this venue would ring a bell); along Rock Creek Parkway as it winds beneath the Kennedy Center; past the Lincoln Memorial and out onto Hains Point, which was the 13-mile, halfway marker. Hains Point is always a unique point within this race, as it cannot be accessed by spectators unless on bicycle, so for those 3 miles between 12-15, it's mainly the runners in sync -- listening to the refrain of their own breath and the multitude of sneaker soles hitting the pavement, over and over. At every water stop we were greeted by Marines in uniform, handing out Powerade and water, Gu and Sports Beans. Their consistent words of support and shouts of "Huyah" continued to power us all as we raced, and at this point in the marathon, as we geared up to put the first leg of the race behind us -- and prepare for the second, more arduous journey -- those shouts of praise were a welcome rally cry. They got us over the hump. From Hains Point we raced back behind the Lincoln Memorial and down onto Pennsylvania Avenue along the Washington Mall, running beside our nation's national monuments and reflecting pool, which has served as the site of countless demonstrations and celebrations alike. At this point, I saw my family again, and as my body was more tired now and with fatigue setting in, it was a welcome respite for even only a second. Then, as I passed mile-marker 18 and turned right onto E. Capitol Circle (and prepared myself for what runners call The Wall), an amazing thing happened: running in front of me was a Middle-Eastern woman wearing a shirt that read, "I run because I can. I can because I am free. I am free because I am an Immigrated American." At this very moment, as I looked at the words on her shirt, my eyes glanced for a second to the left, and there before me, blinded by the late morning sunshine with the azure sky behind, stood the dome of our nation's Capitol, soaring above. Words cannot begin to describe the raw emotion and pride which ran deep within me in that moment -- of being an American, of the civil liberties that are our honored and inherent right. As I ran beside our fellow troops (one of whom was running barefoot in fatigues!! ), and in honor of our fallen troops, in that moment I had this wellspring of patriotism and energy and to my utter disbelief, it took the power of the dreaded Wall away. I looked at the back of that shirt and kept repeating outloud the unofficial motto of the USMC which my brother had shared with me -- Improvise. Adapt. Overcome. Over and over. Pain is temporary. Again and again. And to my utter disbelief, I never hit The Wall. I am still amazed two days later! From here we raced down the back side of the Mall, past the Air and Space Museum, Smithsonian, the Washington Monument, and out onto the Rochambeau Memorial Bridge over into Crystal City. This would be the final chapter of the race, consisting of the last three miles, which brought us through Crystal City Square, then out behind the Pentagon as we passed the September 11th memorial, and finally into the home stretch which leads to the grueling last 1/2 mile straight up to the Iwo Jima Memorial. As I ran towards Iwo Jima, it was hard not to bear witness to the most humbling part of the race itself -- seeing our male and female veterans in wheelchairs, whose arms had carried them 26.2 miles, giving everything they have to get up that hill and finish. My legs may have been tired but they were beneath me. It was so incredibly inspiring and moving to see these valiant individuals, whose names we so often read in the paper but don't have the opportunity to connect with on a meaningful level, digging deep to reach that summit. And it brought me back to why I ran this past Sunday and brought tears to my eyes. It was a memorable day on so many fronts. 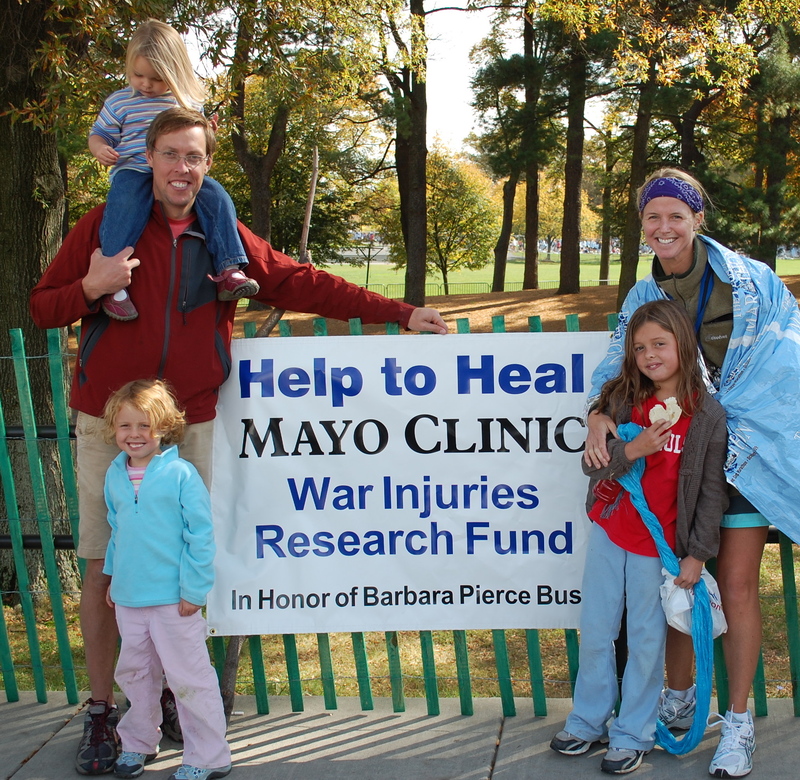 Most importantly, together we achieved the main goal set forth last spring -- to establish a fund in thanksgiving of Barbara P. Bush committed to assisting our veterans thanks to the Mayo War Injuries Fund. And secondly, through being inspired by your generous donations, the ability to complete my training and achieve my personal goal of finishing in Sub4 (3:55:47). Thanks to your combined efforts and generous commitment to the cause, you brought both dreams to fruition. And in return, you have given the greatest gift to our wounded veterans -- the hope that someday, thanks to the skilled care at the Mayo, they too might also be able to run this incredible race.